Posts categorized "ANIMALS & ENVIRONMENT"
"Commercial honeybee enterprises began feeding bees high-fructose corn syrup back in the 70's after research was conducted that indicated that doing so was safe. Since that time, new pesticides have been developed and put into use and over time it appears the bees' immunity response to such compounds may have become compromised. "The researchers aren't suggesting that high-fructose corn syrup is itself toxic to bees, instead, they say their findings indicate that by eating the replacement food instead of honey, the bees are not being exposed to other chemicals that help the bees fight off toxins, such as those found in pesticides." Something apparently we cannot blame on global warming or climate change. bungee cords and tarps to protect their cars from marauding vultures. A few years ago, hog farmers throughout the Midwest noticed foam building on top of their manure pits. Soon after, barns began exploding, killing thousands of hogs while farmers lost millions of dollars. A team of University of Minnesota researchers is looking to find a fix for the foam that is plaguing hog farms. Hazy, smoggy skies on baby Earth could have provided the chemical building blocks of the very first life on our planet, according to a study of one of Saturn's moons. Primordial Earth likely had a layer of atmospheric haze, similar to the one currently on the moon Titan, that may have served as the principal reservoir of life’s building blocks, according to the study in the Proceedings of the National Academy of Sciences. The link is here. Have you thanked your local pollution today? 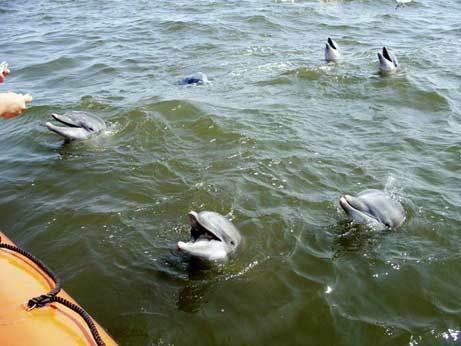 Good news, post-Katrina- NationalGeographic.com carries the above photo and the inspiring news that the 8 dolphin residents at Marine Life Oceanarium in Gulfport, Mississippi, who were swept into the Gulf of Mexico, have been rescued. "All eight dolphins survived and were spotted swimming in the Gulf by National Oceanic and Atmospheric Administration scientists during an aerial survey of the hurricane damage. Oceanarium staff members are now working with NOAA and other organizations to tend to the marine mammals until they can be taken to nearby saltwater pools for medical care." These animals are amazingly resilient. Hope this brightens everyone's day. Thanks to National Geographic for the info.